A visit to Sucre, a city located in the Bolivian Departamento (State) of Chuquisaca, was on the PAZA “To-Do” list for 4 years. At the 2010 Tinkuy International Weaving Conference in Cusco Doña Máxima was enchanted with the traditional dress of the weavers from the Sucre based weaving association called Inca Pallay. The stars aligned in mid-October and we made the trip. After the travel issues we experienced traveling to the 2013 Tinkuy, it seemed prudent to make a reconnaissance trip with just Doña Máxima prior to involving more weavers. Only overnight buses travel between Cochabamba and Sucre, so we left at 11:00pm Friday night and arrived at 5:30 Saturday morning. The first order of business was to seek out Inca Pallay. They had not attended the 2013 Tinkuy, so I breathed a sigh of relief to see the sign above their door, just as I remembered it from a 2008 visit. Don Freddy, one of the Directors, was in their store/museum and he showed us around. 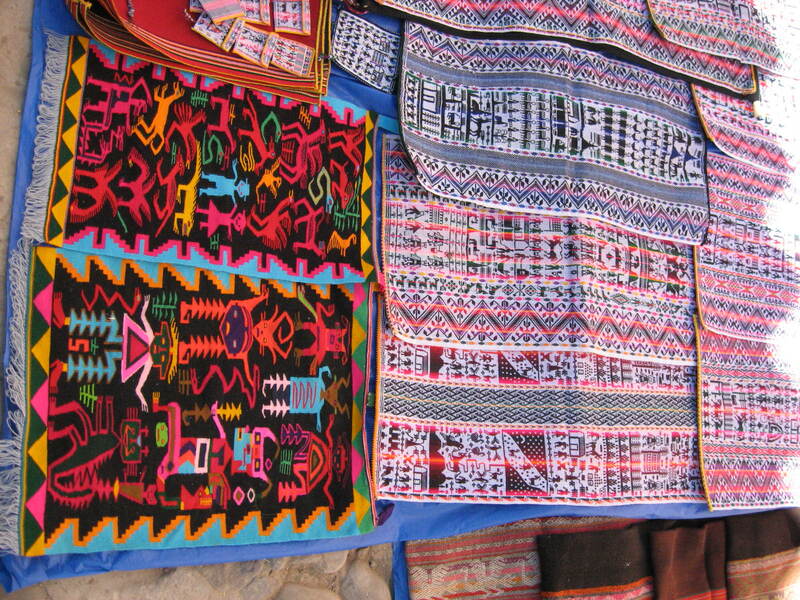 The extraordinary textiles of Chuquisaca are like none other. The weavings of the Jalq´a region to the west and northwest of Sucre portray the spiritual world, a complex cosmology woven in red and black. The weavings of the Tarabuco area to the east and southeast of Sucre depict everyday scenes and rituals with stylized bright multi-colored figures woven on a white background. Don Freddy showed us an exquisite Tarabuco weaving with rows of figures depicting the preparation for a wedding, the ceremony, and the following fiesta. 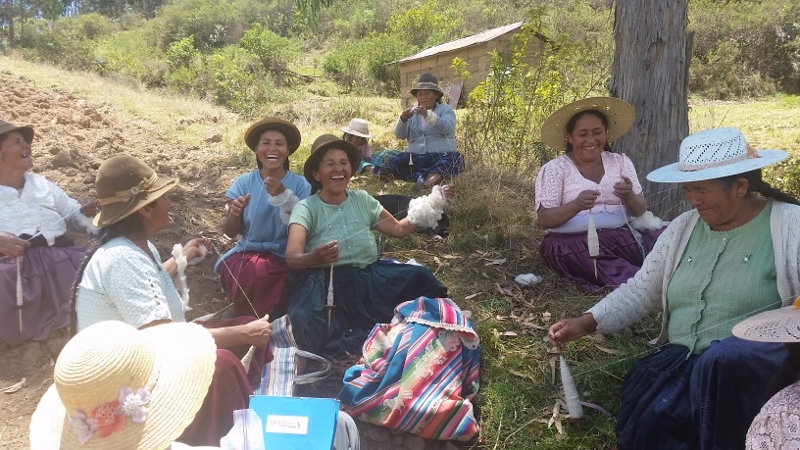 Since 2010, Inca Pallay, has made the transition from grant aid through development projects to just squeaking by self-sustainably. They closed their museum/store in Tarabuco because it only generated income the one day a week when tourists and locals flock to the weekly market. 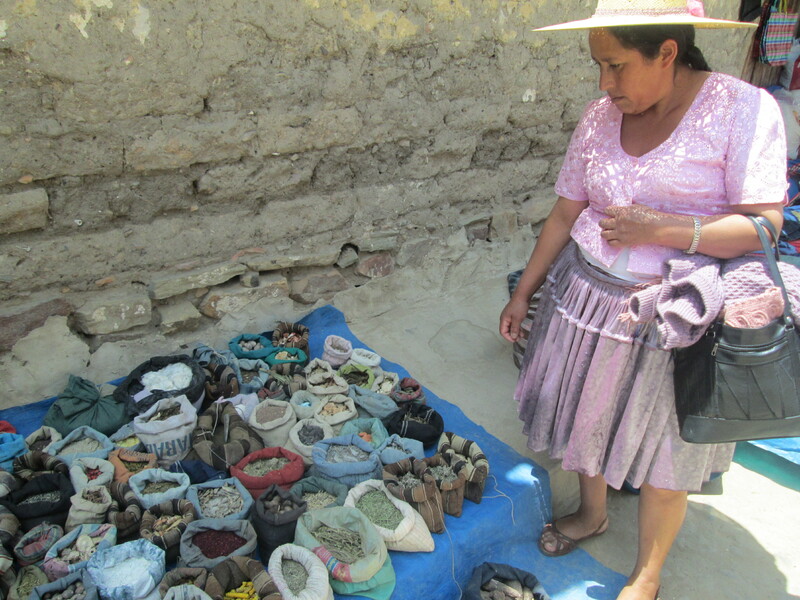 They joined a network of 12 Bolivian craft associations and had an area of their store dedicated to their craft partners, broadening the range of crafts for sale. 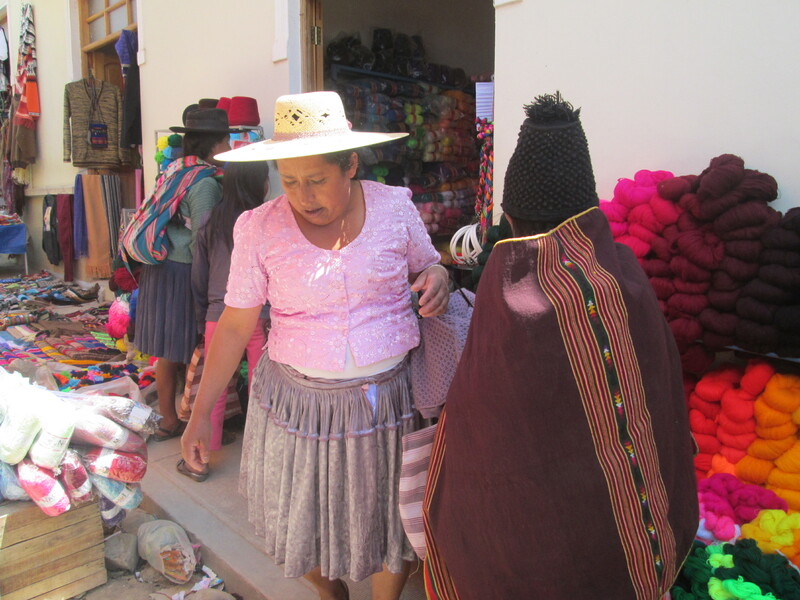 Sucre has an advantage over Cochabamba because it is on the beaten tourist path providing the weavers with appreciative buyers with the means to purchase the textile works of art. 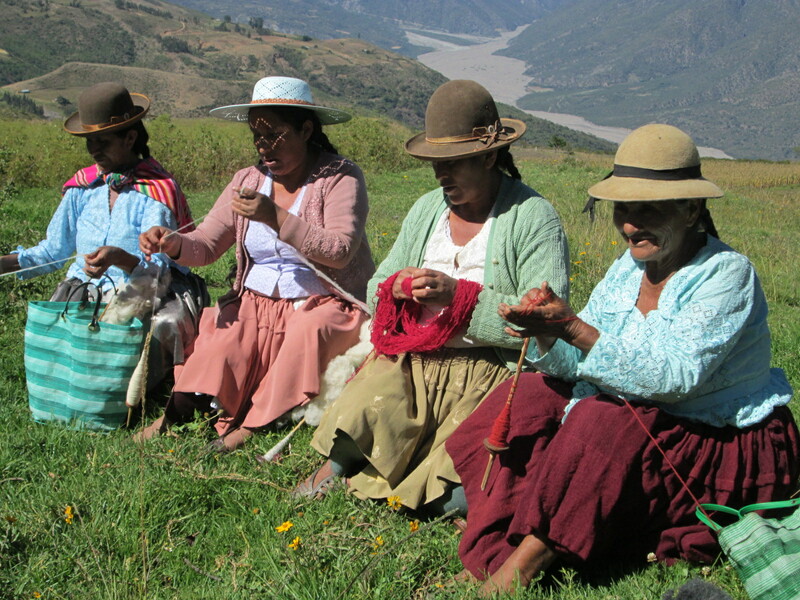 Our best wishes go with Inca Pallay as they struggle to provide a secure future for the weavers and their unique weaving tradition. In the late afternoon Doña Máxima and I walked uphill to ASUR´s Arte Indígena museum. 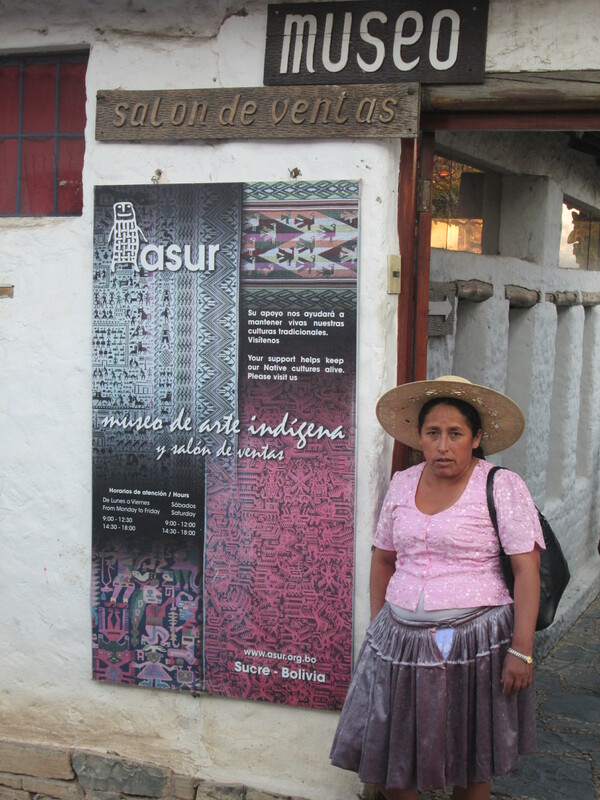 I cannot do justice in this space to ASUR´s fascinating history as an Andean textile revival movement. Please discover it for yourself by reading Kevin Healy´s book, “Llamas, Weavings, and Organic Chocolate”. The museum´s collection of textiles is spectacular. As I lingered to read the explanation plaques Doña Máxima grew restless. She was not aware of the existence of museums until our 2010 trip to Cusco, and although each trip includes at least 1 museum visit she prefers learning through doing. In 2008, I wrote a Peace Corps grant to visit Sucre and the Tarabuco market with the young man responsible for tourism in Independencia. The objective was for us to learn about the textile revival movements and tourism in a place where there are tourists. At the Sunday market in Tarabuco, he interviewed a number of weavers who were selling their work along the streets surrounding the plaza. Doña Máxima and I went to Tarabuco so she could interact with the local weavers. Tarabuco had changed. There weren´t any individual weavers selling in the streets, and the vendor stalls or stores selling weavings exhibited a mish mash of sun faded local weavings and machine woven weavings from who knows where. 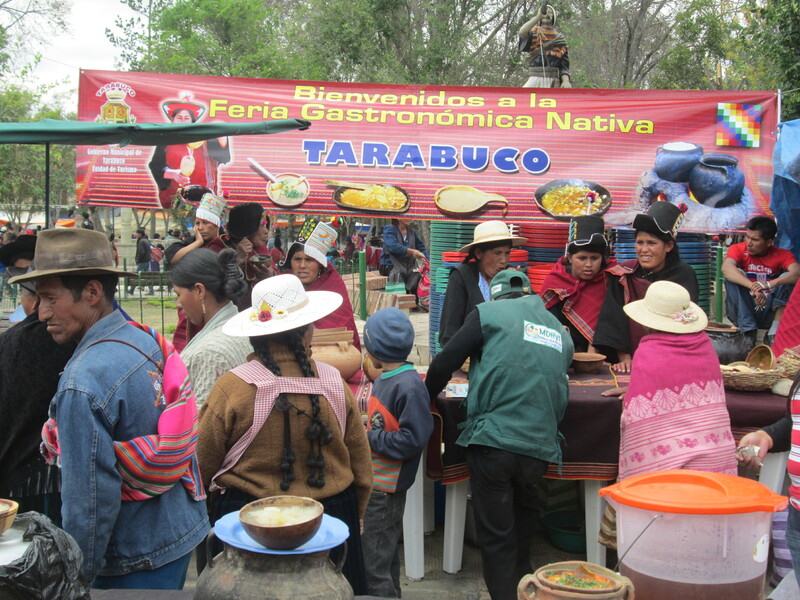 It was the Fiesta de Santa Rosario, the patron saint of Tarabuco, so we did watch the church procession as well as attend the Native Food Fair.